Sea Cow is also known as Dugong dugon is a medium size marine mammal, generally from 2 to 2.6 meters long. The dugong is the only sirenian in its range, which spans the waters of some 40 countries and territories throughout the Indo West Pacific. Dugongs, along with other sirenians are referred to as "sea cows" because their diet consists mainly of sea-grass. This species is generally found on the shores of the Indian Ocean. However, they have been observed in the Gulf of Kutch, on the coast of Malabar and around the Andaman Islands. At one time it was very abundant in the Gulf of Mannar. In Dugongs neck is absent and the massive head somewhat truncated appearance interiorly. The mouth of the animal is small. The colour is variable from dull brownish grey dorsally to grey on the sides and fresh colour ventrally. 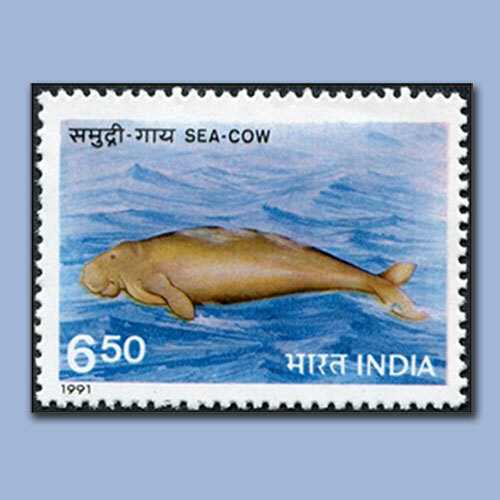 The department of post issued commemorative postage stamp depicting Sea Cow to create awareness for the preservation of the habitat of this species.